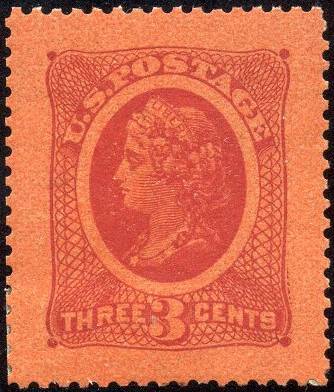 Printing the stamp’s design in alkali ink on paper sensitized with acid ink resulting in the cancellation ink discoloring the stamp’s primary color. Applying pulverized starch to the upper surface of the stamp so when the stamp was soaked in attempts to remove the cancellation, the starch dissolved and the stamp’s design disappeared. 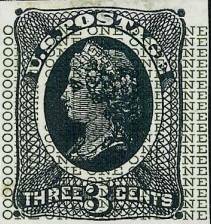 Embedding grills in the paper, i.e., making breaks in the paper used to print the stamps so that the cancelling ink would deeply penetrate the paper. This was the method most commonly adopted and provides an intriguing collection theme. This meant even regular pen ink, which was used to cancel stamps at smaller post offices, would be impossible to completely remove. For some ideas to prevent removal of cancellations, essays were made to illustrate the working of the inventor’s proposed solution. An essay is a design for a stamp submitted to a government for approval but was neither accepted nor issued, as explained by Clarence W. Brazer who in 1941 wrote, Essays for U. S. Adhesive Postage Stamps, the definitive work on U.S. stamp essays. One of the most fascinating of these essays is the 3-cent Liberty “Rainbow”. 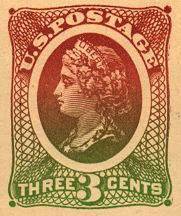 The idea for the rainbow variety was to print various portions of the stamp in different colors so that any color cancellation would show on some part of the stamp. The colors on the stamp blended from one to another, like a rainbow. 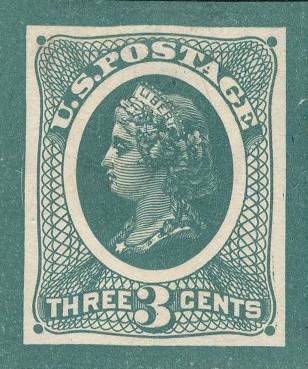 The Scott catalog numbers for the Liberty head essays are varieties of 79-E30 (a through w) and 79-E31 (a through h). Examples of the various non-rainbow E30 and E31 essays are shown here. Scott 79-E30o-r are the rainbow varieties. For the 79-E30o variety, Scott has 13 catalog listings for the various color shadings on each: red brown into dark orange, dark orange into brown red, yellow green into dull carmine, orange to deep blue, deep blue to orange brown, etc. Examples of several of the 79-E30o essays are shown here. Over the years, the Scott 79-E30p block of eight shown below - that has all 8 of the Scott listed color combinations for the p type - has been offered in various auctions. This is a truly unique piece. 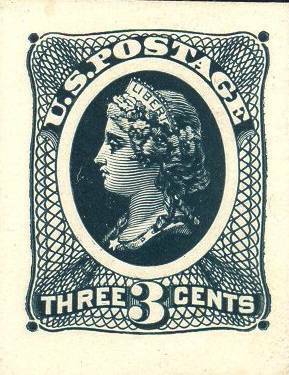 viable solution to the potential removal of cancellations on postage and revenue stamps? As with most of the ideas submitted to the government, the rainbow color solution was too expensive to adopt and maintain for the ongoing issuance of stamps. And, regardless of the number of color shadings that were tested, the removal of cancellation ink on any color combination was still possible. 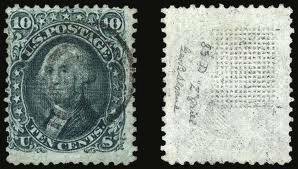 As presented earlier, the grill method proved to be the best choice for the prevention of the removal of cancellations, both from a cost perspective of producing stamps and the successful testing of the technique. The Liberty rainbow essay experiment was not a winner in this competition, but it is certainly a colorful chapter in the history of U.S. stamps.